​Do you have a car whose color and exterior appearance makes you uncomfortable while driving? if you are, you should consider the step of personalizing it using various types of car wraps in the market. Using car wraps is much easier, cheaper, and fun as compared to the painting process. You can have your car customized to the color and design of your liking and in no time, it will be fully transformed. At Rm Car Wraps Littleton, we provide you with an opportunity to reimagine your car if you do not like the color you bought it in or are bored of having the same car color over a certain period. Take a look at some of the car wraps Littleton options and services that we offer to fulfill your desires fully. 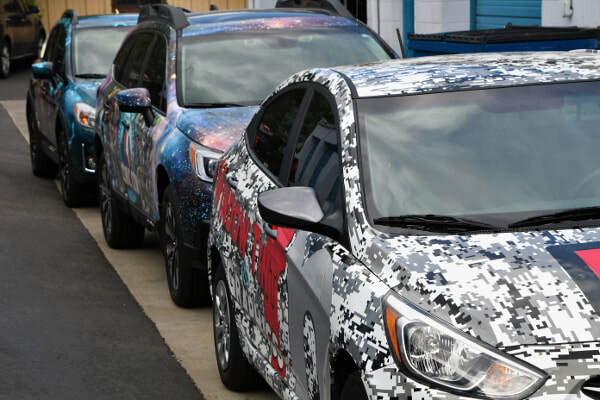 If you are looking to have the color and impact of your vehicle changed, these are some of the advantages that you should expect, courtesy of Rm Car Wraps Denver. • Since there is no need for a paint respray, car wrapping is made effective, quick, and a bit cheap for you. • When you opt for the car wraps Littleton services, the process can be reversed when you feel the need to have the car as it previously was. • You can use car wraps to help protect your car board and paint from abrasions and sun damage. • Personalization features can be used on your car like; using car wraps on side mirrors only, the roof, the wing mirrors, or the tire grills. At Rm Car Wraps, we aim to provide total satisfaction to our clients by remodeling the look of your car to resemble the original paintwork. Call us today to find out about our current deals for the Denver area and save on select vinyl wraps! ​We all have different preferences when it comes to the car choices we make. Some of us opt for a dramatic look while others are looking for a cool, classic look. We can help you give your car that one-of-a-kind look. We have printable car wraps that you can design on your own or have our reliable artists come up with something extraordinary for you. We guarantee high quality vinyl wraps Denver services from our certified and accredited vehicle wrappers. We use quality materials and technology-based innovations to help you create an extraordinary graphic look for your car based on your taste and preference. Are you a business person looking for ways to promote your products or services but haven't found that good opportunity? Here at Rm Car Wraps Littleton we provide Littleton car wraps that you can use to advertise your business. The car wraps can be tailored to the logo of your company or with imagery that features what your business is all about. This is a good way for you to attract more customers and keep the loyal once fully intrigued to be in business with you. We aim to provide high-quality car wrapping services to our clients in the Denver area. A good example of the Denver car wraps available are the vinyl wraps offered to residents of Littleton. We rely on high quality vinyl wraps Denver and vinyl wraps Littleton to transform your car to the style, color, and design of your liking. We have custom made car wraps from top quality vinyl wraps Littleton that help personalize your vehicle. Contact us today by accessing our forms on our website or visit us for any inquiries with respect to car wrapping Denver and car wraps Littleton. Our services are reliable, fast, and stylish. Visit us today to have your car customized to the style that you have always desired. We make dreams come true! We have some extraordinary head turning looks for you to consider from our variety of products and services. Carbon fiber is one of our textures, colors, and finishes you can choose from to have your car transformed through your re-imagination. Why do you need a respray when custom car wraps Littleton and Denver car wraps are available for you! You can visit our website or contact us via 303-732-6637 to know more about our company's vinyl wraps Littleton. You can even inquire about authorized dealers near you so that you can enjoy our quality services. We would like to hear from you as you get to learn more about our car wrapping Denver and Littleton car wraps. You can also inquire about our car protection products that can help cover your car from sun damage, mild abrasions, and other forms of damage. When you are satisfied, we are happy!